FREEDOM Day, on 27 April, is dedicated to the first democratic elections in South Africa. 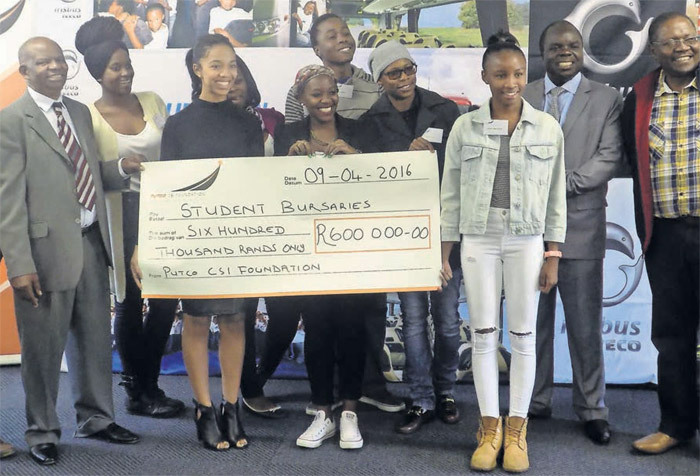 Nothing shouts freedom quite as loud as an education, and that is why Gallo Manor-based business, Putco, decided to celebrate freedom month by awarding 23 tertiary education bursaries to students. Putco is the largest and oldest South African public bus operator. Jacob Sishuba, executive stakeholder liaison said, "My message to the youth is that they must celebrate their freedom by renewing their commitment to their studies. The Putco Foundation dug deep into its pockets and allocated funds to these deserving young people because we believe in them." Franco Pisapia, managing director of Putco said, "To borrow from President Nelson Mandela's words, 'education is the most powerful weapon which you can use to change the world'. We have always been passionate about education, and given the rising inequalities in society, as well as the high costs of obtaining an education today, which places one in a better environment to change their own circumstances and communities. "We are thankful that the Putco Foundation has dug deep and found means to enable these young, talented and bright minds to obtain more from life. It is a privilege to see the impact of what happens when we pull together." Putco chairperson Dr Anna Mokgokong expressed, "Remind yourselves of the oath you made to your families —to be educated, liberated, empowered, socially responsible and be exemplary leaders in your respective communities." Sishuba ended off by saying, "It is not only a smart gesture to award bursaries, but a responsible step towards contributing to government's programme of transformation and modernising our economy." Sishuba urged all young people in the country to continue working hard to empower themselves with an education.